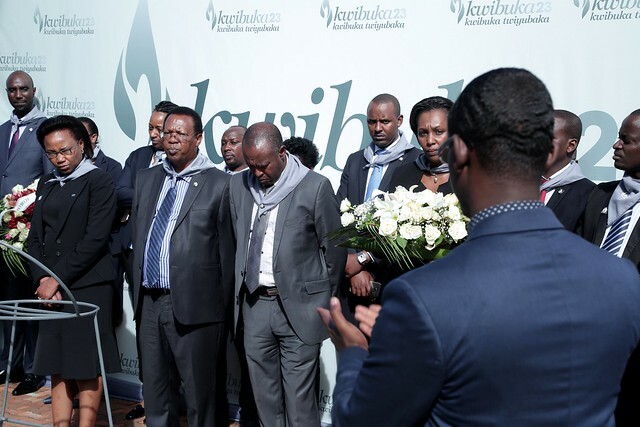 Ecobank staff in Rwanda have visited the Kigali Genocide Memorial to commemorate their beloved ones and learn the history of Rwanda – before, during and after the Genocide. The staff started their visit by touring the memorial to learn more about the causes and consequences of the Genocide as well as other genocides that have taken place around the world. They also learned about the effects of genocide and different measures that can be taken in order to prevent it from happening again. They also paid their tribute to the children killed in the Genocide against Tutsi through visiting the children room, one among other parts of memorial’s exhibit. The team continued their visit by laying wreaths on the burial place where over 250 000 victims of Genocide against the Tutsi are buried. They also took a minute of silence to honor the lives of the innocent people died in the Genocide against Tutsi. Alice Kilonzo Zulu, the Managing Director of Ecobank said that remembering and paying respects to the victims of Genocide against Tutsi was the purpose of their visit to the Memorial. She also continued by stressing out the importance of the memorial center as it helps various people get the right story to tell the world and learn more about the history of Rwanda of the past and that of today. “This center is actually reminding us and giving an opportunity to people around the world to come, visit, and hear the history of what happened, but more importantly to know where Rwanda is now and its progress,” Alice added. Nshumbusho Vianney, the Chairman of Ecobank concluded by calling everyone to leave the past aside but not forget it. He encourages everyone to perceive the importance of commemorating the people who lost their lives in the 1994 Genocide against Tutsi. “We as Ecobank staff, it is very important for us to remember and not stay in the past. We have to move forward and think about our future but we can not forget. Nothing can stop us to commemorate and remember our beloved ones, the victims of genocide against Tutsi. Ecobank will continue to support this activity and other work of the memorial in order to contribute to its journey of preserving the memory and in building sustainable peace,” said Vianney. Kigali Genocide Memorial is grateful for the support and contribution of Ecobank Rwanda to the sustainable development of Rwandan society and other activities of the memorial that help to fight against Genocide ideology and contribute to the well being of Genocide survivors.